Have you ever found yourself at 5pm, staring at a thawed meat on the counter with no idea what to do with it? You know you want to have dinner on the table in an hour but… umm… what do you do with it? You make a fast marinade! I love a good marinade. Soak your protein and let it absorb all the flavors, then you can do anything to it and it turns out great! You can grill, bake, pan-fry, or saute your meat and it WILL be awesome. So here’s 5 marinades that you can throw together quickly when you just don’t know what to do for dinner. Italian salad dressing- I douse chicken with this and sprinkle a little sugar to make an awesome marinade. The sugar helps balance out the vinegar in the dressing. Worcestershire sauce- This stuff is for steak, all the way. I often combine it with one of my McCormick’s Grillmates to marinate steaks before they hit the grill. Adobo+Sazon- These two seasoning blends work on EVERYTHING. I add a packet of Sazon and sprinkle some Adobo and olive oil and my porkchops or chicken are bangin’! Soy sauce+ Ground Ginger+ Sesame oil- When I’m looking to quell an Asian food craving, this is my default. It’s an awesome starting point for a chicken or shrimp stir-fry. Parmesan cheese+ Ritz® Crackers+ Butter- Ok… so this isn’t a marinade. It’s a crusting. And it works deliciously on tilapia and other fish. It also works great on chicken when you’re looking for a little crunch. I coat the meat in melted butter and roll it in a mix of crushed crackers and Parmesan cheese. Any of these marinades can be boosted with a little salt and pepper to suit your individual tastes. 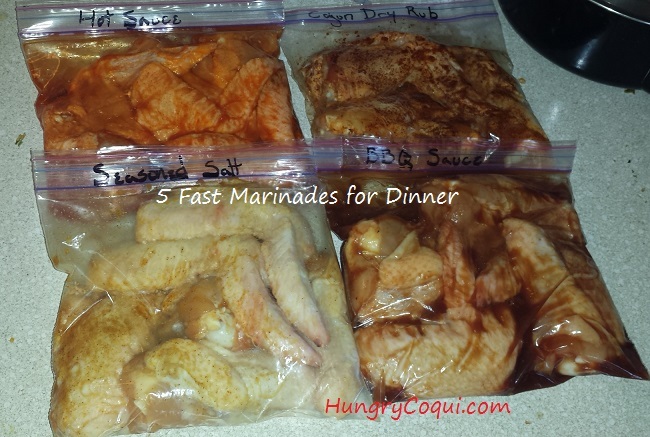 They’re also a great base to make your own custom marinades. Come back and share them in the comments section so we can try them too! Thanks for reading! Which marinade are you tucking into your back pocket for emergencies?